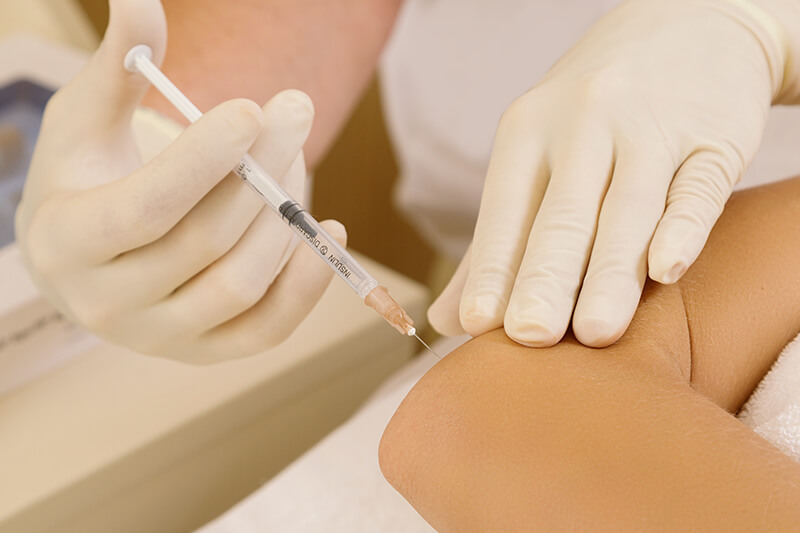 Injection therapy is an extremely effective treatment as part of a physiotherapy programme for conditions such as frozen shoulder, tennis elbow or joint osteoarthritis or it can also be used as a stand alone treatment for conditions such as trigger finger or De Quervains Tenosynovitis (wrist tendon pain). Steroid injections provide an effective anti-inflammatory and pain relieving treatment directly to the joint or soft tissues causing pain. Clinical specialist physiotherapists carry out the injections using ultrasound guidance to ensure the accuracy of the treatment. 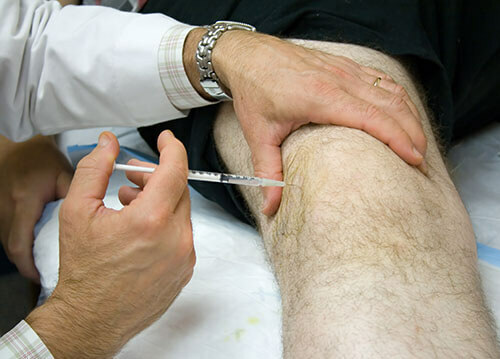 Normally, only one injection is required to gain sufficient pain relief and restore normal range of movement. Some corticosteroids are occur naturally in the human body, steroid injections act like these steroids to reduce pain and inflammation. Steroids can be taken as tablets or given as an injection. An injected steroid uses a much smaller dose to target a precise area of pain. Steroids are often used by people with inflammatory conditions and musculoskeletal pain. They can also be used in degenerative diseases such as osteoarthritis and other soft tissue conditions which involve pain and/or inflammation. Different steroids exist, steroids such as those used for injections take around a week to work but can last for several months after treatment. Before any injection we will perform a clinical examination and a diagnostic ultrasound scan of the effected area .Ultrasound imaging allows for correct diagnosis and accurate placement of the steroid at the painful site.The skin is cleaned with antiseptic. The steroid is then directly injecetedinto the area that is inflamed, such as a joint or around the soft tissue. Shortly after, you will be examined again. Most injections are comfortable and easy to perform. Local anaesthetic can be used with a steroid injection and you may feel pain relief immediatley, this may wear off after a coupke of hours .The steroid usually starts to work a few days after the injection but may take a little longer for significant pain relief to occur. If you are planning to have local anaesthetic, this may cause some localised numbness for a couple of hours and therefore maybe best to avoid driving. After the injection you will be advised to avoid exercise for the first two days. If you have an injection around a tendon we will advise you on when to resume strenuous activity. There can be some minor discomfort at the time of injection. Ultrasound guidance allows many injections to be performed in a way that is much more comfortable for patients. There is a very rare risk of infection following an injection. Every step is taken to minimise this. 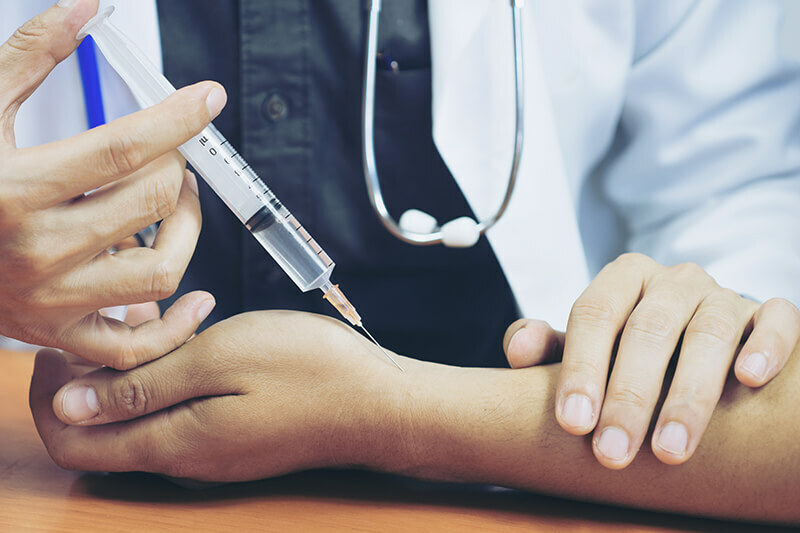 If after the injection the area does becomes more painful, swollen and hot, you are advised to seek medical attention immediately, especially if you are also feeling generally unwell. Some injections occasionally cause local thinning and lightening (depigmentation) in colour of the skin at the injection site. These changes will usually resolve after a few months and the area returns to normal. People with type I or II diabetes may experience a temporary fluctuation in their blood sugars. It is important that you are extra vigilant of your blood sugars for around two weeks after the injection. If you feel unwell after the injection, you should speak to your doctor. Hyaluronic acid injections are normally used for the treatment of osteoarthritis by reducing pain and improving the function. Research has shown hyaluronic acid injections reduce cartilage erosion and periarticular fibrosis. Patients who are active particularly favour these injections as they work to nourish and lubricate joints mimicking the body’s natural synovial fluid, which generally becomes depleted and less viscous with age. From one course you can expect relief for 9-12 months. Ostenil (hyaluronic acid) is widely used in sports medicine, and is used by most UK premiership football clubs, rugby clubs, cricket clubs and the British Olympic Association. The injections can be used on a regular basis if required as they have no known side effects, and they are not known to be detrimental to the body’s tissues in any way. Because of its level of safety, Hyaluronic acid is classed as a ‘medical device’ rather than a drug. For optimal affect, chronically swollen joints can be injected first with steroid to reduce inflammation and then injected with hyaluronic acid around 4 weeks later, reducing the need for repeated steroid injections. All hyaluronic acid injections are delivered with image guidance to maximise their effectiveness. Current research demonstrates that ultrasound guided injections give better levels of pain relief, give longer lasting effects, and improve the functionality compared with injections that are done without ultrasound guidance (blind/surface marked injections). There is also evidence that it reduces the risk of trauma or misplacement of the needle and/or the injection substance, therefore improving the safety of the injection and reducing the risk of adverse events associated with injection therapy. At the Northwood Clinic we combine expert assessment and diagnostics with extensive knowledge of physiology and pathology to accurately plan your rehabilitation.